Fragrant, beautiful, and versatile, lavender is typically added to bouquets or to bathwater for a purifying and uplifting effect. A close cousin of mint, it grows as a small shrub that has lovely violet flowers and green or pale grey leaves. It’s native to northern Africa and the mountainous Mediterranean regions, although it also grows throughout southern Europe, Australia, and some parts of the United States today. If you wish to grow lavender in your own backyard, remember that this lovely plant needs well-drained soil and at least six hours of full sunlight each day. For best results, use a soil mixture that has a higher sand content than clay so your plant will grow healthier and will produce more baby plants. Adding peat moss around the first lavender plant is essential, and so is giving it enough water during the first season. 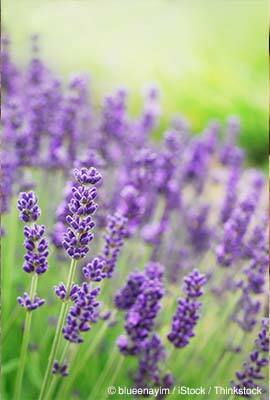 Once the lavender plant grows well, it will be resilient enough to handle drought conditions. Lavender leaves and flowers, whether fresh or dried, are edible and have a mildly sweet but slightly bitter aftertaste. They can flavor salads, jellies, sorbets, desserts, and beverages, and can also be added to sauces and marinades. Unclear about whether you should use fresh or dried flowers? Here’s a tip: fresh blossoms flowers have a sweet and stronger flavor, and are great for desserts. Meanwhile, dried flowers are “herbier” and can be used for more savory dishes. The health-conscious need not worry about using lavender, as it only has a few calories per tablespoon. There are over 100 known compounds in lavender, including phytochemicals and antioxidants. The most well-known of these is limonene, a type of terpene that stimulates the digestive enzymes in your liver and helps detoxify your body, ridding it of carcinogens. According to animal studies, limonene can also help reduce tumor growth. Caffeic acid is another constituent of lavender. Previously believed to be carcinogenic, caffeic acid was found to actually help inhibit cancer growth and have tumor-shrinking properties. Also beneficial are coumarins, a group of compounds responsible for lavender’s fragrance. Studies have found that coumarins have complex multi-biological activities that may prevent HIV, tumor, hypertension, and osteoporosis. However, coumarins are moderately toxic and should not be consumed in amounts over 0.1 mg per day. Otherwise, they may cause liver and kidney damage. Lavender has been used to remedy numerous ailments, owing in large part to its very calming effects. When seeped as tea, lavender blossoms can help alleviate stress, anxiety attacks, rheumatism, distension, and insomnia. Adding the fresh blossoms to your bathwater can help relax and ease tired muscles. A study conducted by scientists from the University of Coimbra in Portugal found that distilled lavender oil was lethal against a wide range of skin pathogenic fungi strains, known as dermatophytes, as well as certain Candida species. Dermatophytes can lead to skin, hair, and nail infections, while Candida can cause an irritating ailment called Mucocutaneous candidosis or thrush. Another study, conducted by researchers from Keukdong College’s Department of Nursing in Chungcheongbuk-Do, Korea, revealed how lavender fragrance soothed female college students, helping relieve their insomnia and depression. Researchers from King’s College in London also found that lavender scent has a profound effect on relieving anxiety in dental patients.“Our findings suggest that lavender could certainly be used as an effective ‘on-the-spot’ anxiety reduction in dentists’ waiting rooms,”lead researcher Metaxia Kritsidima says. Mix the lemon juice, salt, lavender, mustard, garlic, and balsamic vinegar in a bowl, and then whisk. Slowly drizzle the olive oil while whisking, until you’ve added enough. Lightly grill the peaches on the grill or in a pan on the stove top. Drizzle the dressing on the salad, and then serve. Lavender has long been associated with royalty, queens in particular. It was said that Queen Elizabeth I drank lavender tea daily to relieve migraines, while Queen Victoria commanded her servants to polish her furniture with a lavender-based solution. The beautiful Egyptian queen Cleopatra was said to have used a lavender-infused perfume to seduce Julius Caesar and Mark Anthony. Lovely lavender: it’s fragrant, refreshing, and one of the most versatile plants you can use in the kitchen. Low-calorie and free of fat and cholesterol, this blossom can flavor beverages, sauces, and marinades, and can add a colorful twist to your favorite salads, sorbets, and desserts. When it comes to nutritional value, you will not be disappointed: lavender is chock-full of phytochemicals and antioxidants that not only has anxiety-relieving properties, but also has potentially anti-cancer effects. No wonder the nobility loves it! To make an invigorating cup of lavender tea, simply add two teaspoons of dried lavender flowers to an eight-ounce cup of boiling water, then sweeten with a teaspoon of organic honey. It’s a great remedy for relieving stress and alleviating headaches.